In this issue of WHOTT Web News we take a brief at Pangs of nostalgia and How as schoolboy's dream came true. Engineers reading the trade press of 9th May 1942 would be tempted to take up Tillings’ invitation to any of them running more than ten buses to view their plant at either Maldon or Cromer. About this time the Tilling Group had also been exploring the virtue of constructing brand new vehicles that were purposely built for gas propulsion without the use of trailers. Two such chassis, both modified L types were somewhat usually fitted with larger Gardner 6LW engines to compensate for the loss of power running on gas. Special permission was obtained to have the overall length increased from 27’6” to 30’0” and the engine was mounted forward on the chassis with protruding radiator so that seating accommodation was not compromised. The wheelbase was extended by 12” to keep the rear overhang within current regulations. 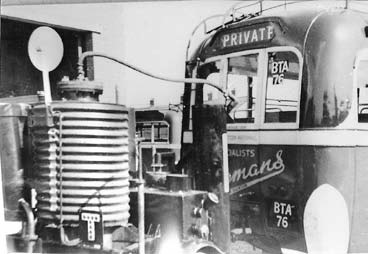 The producer plant was mounted in an insulated compartment at the rear with two water cylinders mounted on the roof. 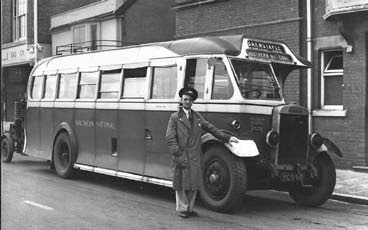 Although both vehicles were registered to the Bristol company, they found their way from the Eastern Coach Works wartime factory at Irthlingborough to the Eastern National and Eastern Counties companies. On 22nd May the Eastern National bus, registered HHT459, was driven to Berkeley Square, London to be inspected by Lord Leathers, Minister of War Transport, who was taken for a lengthy spin round the block. Sir Cyril Hurcomb, Director General of the Ministry of Transport and Joint Parliamentary Secretary, P J Noel-Baker, were also in attendance. The occasion heralded the government’s announcement that 10,000 vehicles would be converted using its own improved ‘GEP’ (Government Emergency Producer) trailers. Two views of Leyland LT Lion 2979 (YC9414), an early conversion at Barnstaple where it proved very successful, running on gas for 4.5 years. Close up of the trailer behind Dennis Mace 616 (BTA76). Three Maces performed well with GP units on Taunton town services. How a Schoolboy's dream came true. 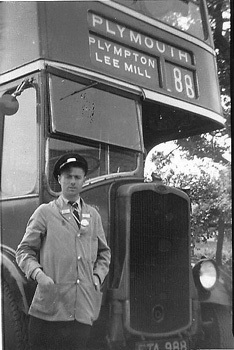 Jo Clarke described his favourite bus, the TSMs of Western National. This time he reveals the passion that led him to driving for that company By the time the war ended in 1945 we, as a family, returned from Cornwall to Devonport to live over a shop. My interest in the ‘green’ buses had grown a great deal and where we lived was close to a lot of bus routes and Dockyard Specials. 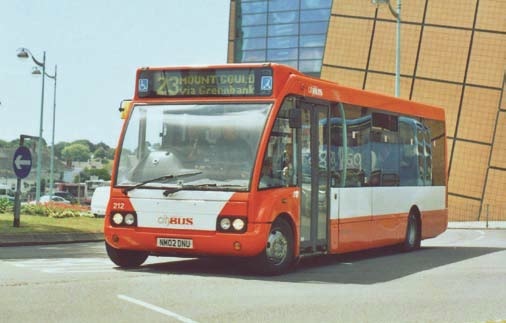 My cousin, John, lived with us at the time and although he, Pat my sister, and myself often walked to and from school in Keyham, when we did go by bus, several would be allowed to pass before boarding our favourites on route 95 Hooe – Saltash Passage. These were usually the Bristol K5G ‘deckers’ with their 1940s Eastern Coach Works bodies. Two of these became our absolute top favourites dating from 1937 (vehicles 249 and 250, mine and John’s respectively). These had been rebodied by ECW in 1942, though to prewar standard of finish with leather –edged and moquette seats, 6-bay timber framed bodies and beautiful white ceilings. We usually loved to sit on the front nearside seat so as to watch the driver through the window and for me, to one day drive one of these became a dream. As a boy I worked on the all-steam railway in West signal box at North Road Station, Plymouth and in the Downside Inspector’s office. However, it was in the army, which I joined aged 18 for two years National Service, when I first learned to drive with the Royal Corps of Signals. After basic training at Catterick in 1951 we went up to Ripon to be trained on brand new trucks of Bedford, Austin and Fordson make. All of them were army designated as 3-ton. The training we received was excellent, one of my instructors was a former Royal Blue driver called Williams from Penzance. I remember he helped me to develop ‘night vision’. Next it was a posting to the Egyptian Canal Zone at Fayid. There all our vehicles dated from the second world war, again mainly Bedfords and Austins and although my first allocated vehicle was a Bedford water tanker, my favourites, which I called ‘Ship of the Dessert’ because of their 4-wheel drive, were the Bedford QLs. The QLR radio and cipher, but especially the QLT trooper, were as close as one could get to driving a bus. 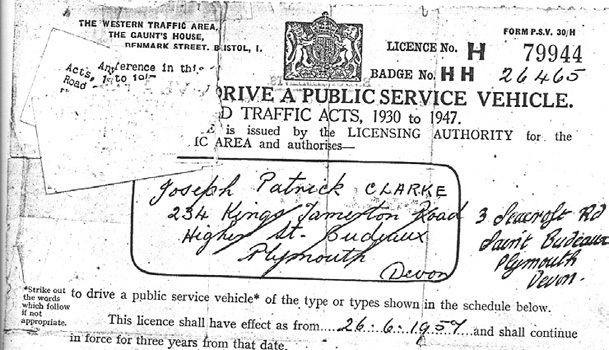 Returning from Egypt in 1953, and back on the railway, I had to wait three more years before I could apply to the Western National for a PSV driving test because at that time one had to be 23 years old to drive for Western National. So early in the season of 1956 I turned up at Laira Bridge garage to take the company test, along with four or five other recruits. There, waiting in the yard with L plates attached, was Bristol K5G number 250, of our schoolboy journey days! Possibly sensing my enthusiasm, the garage foreman sent me first up into the cab where I was about to get my first experience of driving an oiler. Of course I knew something of what to expect having travelled on these as a teenager. The engine was cold, so putting it into second gear, letting out the clutch pedal while releasing the handbrake, I had to press the accelerator pedal to the floorboards before 250 pulled away very slowly in its own time. Bristols were never to be hurried! How could one ever forget that first time, the whole feel of this heavy, lumbering, vibrating vehicle pulling out of the yard with, of course, no power assisted steering. Turning right, up the slight incline with the engine roaring away, then knocking it out of second into the middle of double-declutching, waiting a long time for the engine revs to die down, then going into third and finally into top [in the same fashion]. I was lucky because my gear changing wasn’t too bad. The test took us around the busy city streets, then up Tavistock Road, past the museum which would later play an important part of my career in archaeology. From there down Alexandra Road and then turning right up the steep Lipson Hill. Half way up, round the steepening bend, I was belled to stop. Someone got off the platform and put a matchbox behind a rear wheel, then I was belled to pull away. The garage foreman had already warned me not to attempt a change out of first gear, so off I went with good clutch control. Up at the top I had to reverse into a side road on my nearside, using of course my side mirrors. This too was done satisfactorily. Back at the garage the foreman told me he would put my name down for the PSV test when the examiners were next down from Bristol. After a few weeks we turned up again for the test and there was 250 ready in the yard. All went well for me, save that for some reason, maybe I was too excited, at one point I didn’t take enough care in my reversing. Driver Clarke at Ivybridge with Bristol K5G number 243 (ETA988) originally a Southern National vehicle at Weymouth but transferred to Western National on 1st March 1959. Plymouth Citybus 212 (NM02DNU), this 2002 Solo M850 had a relatively brief stay in Plymouth arriving in January 2010 and departing the following year to fellow Go Ahead operator Damory Coaches. It is seen at Charles Cross on service 23 to Mount Gould.